Video interviews speed up the hiring process. This is one of the best reasons to incorporate video interviews into your talent acquisition strategy. The advantages of hiring employees more quickly are even more important for staffing agencies, where timing and turnaround are essential parts of the business. Don’t waste another second! Here are 5 ways that video interviews speed up placement for staffing agencies and their employees. We all know that phone interviews are a great time waster. How many times have you begun a phone interview with a candidate, and known in the first 2 minutes that s/he wasn’t a good fit? 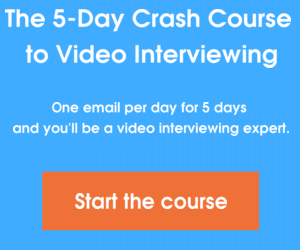 You can stop conducting a one-way video interview after 2 minutes. Save yourself the extra 28. Video interviews are more accurate portraits of candidates than paper resumes or phone interviews alone. That accuracy prevents more unqualified employees from walking through the doors of staffing agencies. Two-way (or live) video interviews can also replace early round in-person interviewing, reducing the overall number of in-person interviews you have to conduct. Speaking of scheduling… one-way video interviews drastically reduce the amount of time staffing agencies spend e-mailing candidates back-and-forth. One-way video interviews require no scheduling–just a due date–and they provide a more accurate look at candidates earlier in the hiring process. This means you can contact fewer candidates for interviews during the hiring process as a whole. For staffing agencies that have consistent client placement needs—you have a client that always needs telephone sales people, for instance—it’s easy to create a one-way video interview for specific job openings. This allows you to ask job-specific questions (that can be saved for later use) earlier in the hiring process, which allows for better candidate placement. This is a special perk for staffing agencies. Clients who need a staffing service often want to interview employees themselves before placement, which adds time to the process. One-way and live video interview recordings can be shared with your clients, reducing the need for a special round of interviews. Your clients can reap the same time-saving benefits of video interviews, which makes your staffing agency look pretty savvy. How else can video interviews speed up your staffing and placement process? Let us know below!